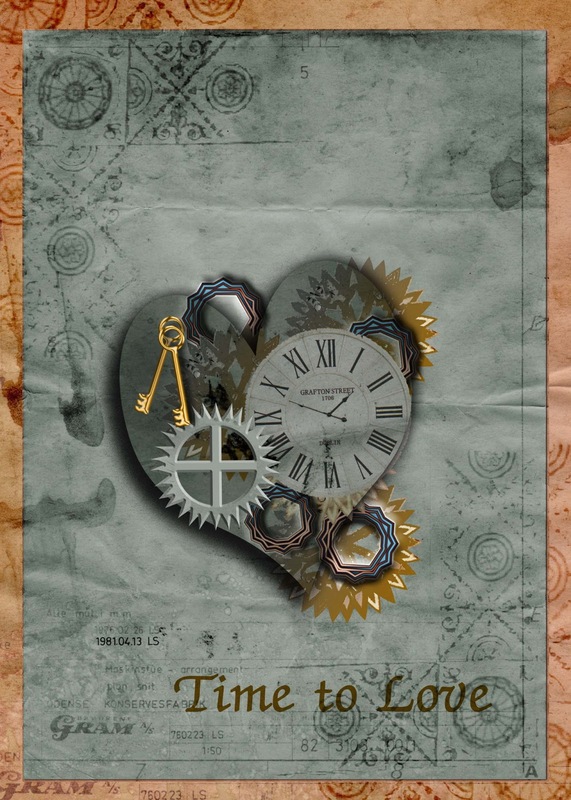 In keeping with the current challenge running over at the Stampin' with the Dragon challenge blog, my project today is a digitally created card-topper in the Steam Punk Style. I have chosen not to do a scrap page, instead I like to demonstrate that digital kits are fab for making digitally created cards. I am calling this card-topper ' Steam Punk Heart' and was inspired by some images I discovered on Pinterest and fit very nicely with the Journalling papers from Stamping Dragon Designs. I used two of the papers to create a dark distressed background with a lighter coloured frame. I used my Photoshop to create the cookie-cut heart and distorted the shape and matched the colour with the background. Using the standard shapes in the Photoshop Cookie Cutter tool, I manipulated the various flower, circles and cog-like shapes to make digital industrial shapes and matched the colours to the papers. The clock is a scan from a magazine , cut to size and digitally distressed.. Although I can't wait to get my traditional scrapbooking kits around me, I am more than happy to use digital until that day arrives.